Book Advertisements for Dinamalar Instantly! Welcome to Dinamalar Newspaper Ad Booking Portal. Use this portal to book any Newspaper Ad instantly online for Matrimonial, Property, Recruitment, Public Notice at the lowest rates. Pay via Credit Cards, Debit Cards, UPI, Net Banking or Cheque. Worried about getting contacts, rates, deadlines and manual booking procedures for your Dinamalar classified ads? Your search ends here- Now you can book newspaper classified text and display ads via releaseMyAd - India's largest newspaper ad booking portal. Just 3 simple steps and your ad is booked for the scheduled date.You can avail the best rates and discount packages for your Dinamalar classified ads only at releaseMyAd. Get started ! Q. I want to give want add for Domestic cook for my house at Madurai in Tamil Dinamalar, Sunday issue "Vari Vilambaram". Guide me how to book through internet. I have got Net banking facility in SBI. Please help me with this too. Why advertise in Dinamalar Newspaper ? WHY ADVERTISE IN Dinamalar NEWSPAPER? Welcome to the Authorised Online Classified & Display Newspaper Ads Booking Service for Dinamalar. You can book ads under the Matrimonial, Property, Recruitment and Obituary sections at discounted prices. Instantly! Dinamalar enables you to publish all types of newspaper adverts like Classified Text ads, Classified Display or column ads as well as Display ads under various categories or sections. These categories may be chosen as per your requirement ranging from Announcements and Education to Public Notice and Tender ads. Dinamalar also provides economical discount and combo packages while booking advertisements through the authorised online newspaper ads booking agent-ReleaseMyAd. HOW TO BOOK AD IN Dinamalar NEWSPAPER? 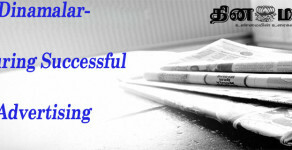 Know how to publish an advertisement in Dinamalar under the category of your choice? On successful payment, you’ll receive an invoice with all your ad booking and payment details. Your Times ad is ready to be published on the specified date(s) once it passes through the editorial approval policies of Dinamalar. ReleaseMyAd (Authorised by Dinamalar) provides you an integrated platform to check ad rates, circulation details, discount offers and book your classified and display ads online for Dinamalar instantly! We are India’s largest and simplest online ad booking service providers! Through ReleaseMyAd you can book Dinamalar Classified Display, Text Classified and Display ads without any extra charges!!! For any more details and queries about Dinamalar and the booking of your advertisement, please visit the Frequently Asked Questions section or Question & Answer Forum. Classifieds Ad Sections LocationsFAQ Why Dinamalar? Advertise in Dinamalar at Lowest Rates via releaseMyAd! Want to Advertise in Other Tamil Newspapers?